Pictured left to right, back row first: David Simpson, Gary Southall, Shawn Cantrell, Chelsea Snow, Stephen Bumgardner and Randy Fields at Kroger #725 in St. Albans, W.Va. Hundreds of Local 400 members are about to receive back pay checks after winning a $90,000 settlement against Kroger, following a grievance against the company over lengthy delays in implementing raises provided for under the terms of their contract. 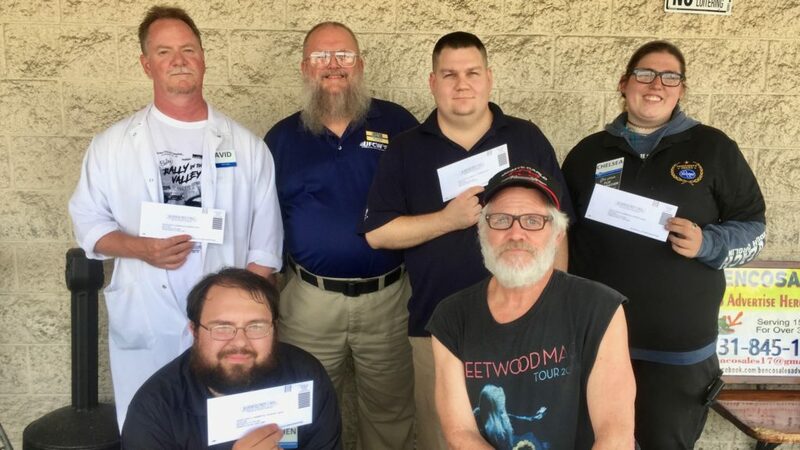 Kroger members in West Virginia ratified a new contract last Fall that provided raises for backups and night crew workers. The contract was ratified on November 6, but the raises were supposed to take effect retroactively to October 7, 2017—the date the previous contract expired. But Kroger didn’t start paying the new raises until February 2018, leaving a roughly four-month gap when hundreds of people should have been paid at the higher rate. “When we went to a meeting on the contract, I saw that DSD [direct store delivery] people got their raises immediately and someone in pharmacy got a raise in December, but they made us wait until February,” recalled David Simpson, a 38-year Kroger veteran who is shop steward and backup meat cutter at Kroger #725 in St. Albans, W.Va.
David filed a grievance against Kroger and with the assistance of his Local 400 representative, Gary Southall, worded it to ensure that it covered all 522 members affected by the company’s contract violation. The grievance went through first, second, and third level meetings and each time, Kroger refused to budge. It was finally slated for arbitration and at that point, the company realized it was unlikely to win and negotiated the $90,000 settlement. “I was very excited about the victory,” Dave said. “A little extra never hurts anybody. I thought I was right all along and this shows Kroger knew it. I told the night crew and everyone was happy. “Kroger’s always trying to put one over on us and this time we got them instead,” he added. The $90,000 settlement is being divided equally among the 522 members who were affected. Settlement checks have been mailed and should arrive in members’ mailboxes over the next several days.